When Mayo Clinic endocrinologist Dr. James Levine was quoted as saying "sitting is the new smoking," his focus was not simply to get people to stand up but to move. With the average worker sitting for 5 hours and 41 minutes a day employers stood up and took action. Many companies embraced standing desks as the new norm as they strove to make their employees and by extension their office environments healthier. But what are truly the benefits of standing desks? Why should someone stand vs. sit? Step one is get up. Step two is learn to get up more often. Step three is, once you’re up, move. Is the benefit of standing desks simply movement? Yes and no. Ultimately, the benefit of standing desks is to give one the opportunity to move. Standing stagnate in one place can be as detrimental as sitting. To get the ultimate benefit, we recommend using a standing desk with a Wurf. Our air-spring like surface allows for unconscious micro-movements throughout the day, allowing one to have their body in good working order without taxing the mind. Standing desks encourage movement. Why is movement so important? Simply your body was made to move. Standing stagnate just like sitting in the same spot for period of time can be detrimental. A standing desk though allows you the opportunity to move throughout the day with micro movements which can increase blood flow, increases muscle strength and ultimately increases calorie burn. 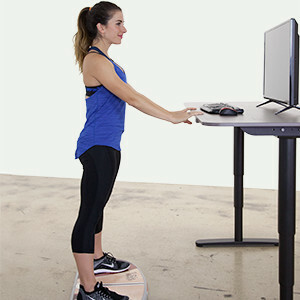 Using an air-spring surface like the Wurf™ Board in conjunction with a standing desk increases your ability to move. Movement decreases known health risks. "People who sit for prolonged periods of time through the day are predisposed to developing diabetes... are prone to cancers, breast cancer, prostate cancer, colon, I mean, multiple cancers," said Dr. Levine in a recent article. In addition to Levine, other doctors have correlated sitting with heart disease as well as obesity. By using a standing desk, we are given the opportunity to change our physicality, move more and engage our bodies while still engaging the mind in work. Ultimately decreasing the health risks we have spent years building up. Increases productivity. A recent empirical study proved that standing increased the productivity in their work environment by 10%. Reports in our own offices shown a marked increase in productivity while using standing desks. Many have started using sitting as the "reward" for finishing a task. For example, when I finish this article I will have been standing for about an hour and a half; at that time I will sit for 30 minutes as I prepare for the next part of the day/project I have planned for the day (I got this tip from another writer when doing research on standing desks and passed it on. It works!). Standing also focuses someone on the task at hand; making multi-tasking (a proven productivity killer) virtually impossible. Overall Happiness & Well Being. Using a standing desk and moving throughout the day, creates a healthier and happier body, mind and spirit. When a person is free from the minor aches and pains sitting in one place for that average 5 plus hours a day cause, they are naturally in a better frame of mind and better spirit. Burning more calories and being more active in a day also contributes to better sleep which in turns helps with a persons over all well-being and mood. Finally, a person who is more productive – both personally and professionally – in their day will feel more a part of a team working towards the same goal. Having an office environment that promotes a sense of wellbeing and overall happiness creates not only a more productive work environment but a more pleasant one. Who does not want a more pleasant work environment?